November 30th is St. Andrew’s Day- a celebration of the Apostle Andrew, Patron Saint of Scotland. Obviously I am not one for the veneration of Saints as it is practiced in some traditions, but taking time to honour the giants of the faith is worthwhile, as they can serve as an encouragement and a “great cloud of witnesses” (Hebrews 12:1) which spurs us to faithful obedience. Andrew is an underrated Apostle (if there can be such a thing) I think. According to John’s Gospel, Andrew was the first to become a disciple of Jesus, having followed John the Baptist for a time. He then introduced his brother Simon (Peter) to Jesus, beginning the circle of followers which would immediately include Philip (from Bethsaida like Andrew & Peter) and Nathanael. The Apostolic age is of course shrouded in controversy regarding how much we can trust of the later accounts. The accounts of Andrew, most notably the Acts of Andrew present Andrew as having a considerable impact on the growth of the Church. According to Eusebius (Church History III.1) Andrew was allotted Scythia (a region around the Black Sea and Caspian Sea including the Caucasus region, Ukraine, Kazakhstan and South-West Russia) as his mission field. Nicephorus states (HE II.39) he preached in Asia Minor, before Scythia and then planted the church in Byzantium, installing their first Bishop (the Bishop of Byzantium, later Constantinople, now Istanbul is now the “first among equals” of all Eastern Orthodox Bishops) followed by mission work in Thrace, Macedonia, Thessaly and finally in Achaia, where he met his demise. In the city of Patras/Patræ in Achaia, located in present day Greece, Andrew is said to have been crucified. According to the Acts of Andrew he was tied, not nailed to the cross (which makes the process much longer) and hung for several days and eventually prayed for his executioners before his death. 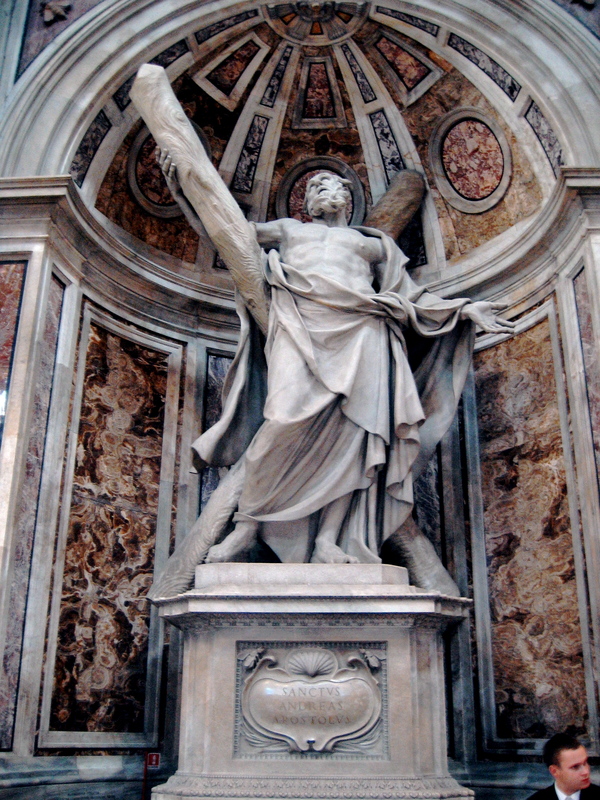 So we see, St. Andrew is phenomenal figure we often miss. Peter, Paul, John and James often take centre stage. But Andrew’s impact is huge, and in addition to being the Patron Saint of Scotland he is also Patron Saint of Russia, Achaia, Patras, the Diocese of Constantinople, Victoria B.C., fishers, unmarried women and many others. This entry was posted in church, history, news. Bookmark the permalink.